A supernatural serial killer. A prophetic gargoyle. A murdered woman. His daughter is on the coroner’s slab, with no sign of what happened to her. Pale. Cold. Dead. He trades what little morals he had for the sword. Now he hunts for the truth, to find whoever did this to his little girl and bring them to justice. Except he has his own dark past and it is catching up with him. He is the cat after the rat, but the dog is coming. Meanwhile a war is building. The world of Nowhere has merged with ours and Excalem finds that he must face angels, ghosts and gods before he can discover the answer he seeks. This book was inspired by the characters. They literary seemed to come from Nowhere and needed a world to exist in. 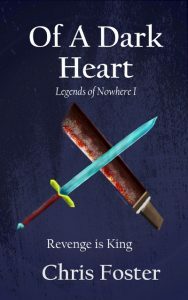 At the time I was writing a number of different stories (still am) so ‘Of A Dark Heart’ is a setup into the interweaving mythology of Nowhere and other worlds. It is hard to pinpoint the birth of my characters. Quite often they just appear in my mind. However I do like to keep plenty of reference material in my mind. This way when my mind performs the voodoo that creates characters/worlds/plots it has plenty of ingredients at hand. For example, Dungeons and Dragons was a big influence at the time, as was a number of anime series. I found looking through a lot of concept art for video games was also really good at getting the imagination flowing. For me it is definitely a visual process. Flat Top Phil was pleased with himself. Driving down the long and barren dusty run with his ute filled to the brim with garbage bags stuffed full of loot, he couldn’t wipe the smile off his face. He had been cleaning up, getting rid of rubbish from the town. Keeping the dry, sand strewn streets as clean as they can be. Putting down his beer for a moment to check his phone, his vehicle veered from one side of the highway to the other. Not that it mattered out here. There was never oncoming traffic this far into the desert. A text message popped up. It said that another family had gone. He responded with the same message he had sent the last two times. See, he didn’t care if people knew his opinion. It was right after all. Ain’t none of those folk meant to be living in his town. No way in hell he would let them befriend his family, his daughter, his wife. No way Josè. That’s why he kept the town clean and tidy. Roaring down the dust highway he took another sip of his beer. Up ahead there was a dust storm picking up. Just between the storm and his fast approaching ute was a man. He was pointing a sword at Flat Top Phil. Slamming his foot onto the weary brake pedal Phil tried to control the careering vehicle he was driving. Bags fell from his flat top ute, their grisly contents spilling onto the desert’s hot floor. The spinning dust was whirling in predatory cyclones. Through his windscreen he watched in shock as the sword wielder didn’t move, even with the storm at his back and a tonne of moving metal hurtling towards him. Crows were circling above. As the ute finally came to rest with its tyres shredded, the man with the sword approached. Flat Top Phil fumbled with his glove box. The force of the sudden and screeching halt had stretched the frame of the car, causing the glove box to jam shut. Sweat was starting to trickle down his face that had nothing to do with fifty degree heat. Grabbing the handle with both hands he finally broke the flap, his fingers desperately clawing the box open. Grabbing his revolver he was too late. There was chill against Flat Top Phil’s neck. His eyes slid sideways until he saw the blade coming through his window. The dust storm was approaching. Flat Top Phil knew he would be a lot safer in his ute than the idiot outside his vehicle. Maybe he wouldn’t need to shoot at all. Theirs? The madman was alone. Did he mean the cleaning? He can’t mean the cleaning. He was sun addled, that’s why he had a sword. The cleaning had been dealt with. The cold on his neck was gone. He quickly took his chance. Flat Top Phil pulled the trigger. The boom echoed inside the ute’s cabin. When he turned to look the man with the sword was gone. Smiling manically he turned his keys to start the engine. He would get out before the storm hit. Something stuttered. Looking down he was horrified to see a deep gash in his dashboard. Swearing loudly Flat Top Phil looked around. The man was gone. Sand was being thrown around in the air like washing hanging on a windy day. The bags filled with the evidence of his cleaning laid strewn across the ground. They were moving in the storm’s breeze. Except as he looked it wasn’t the wind moving the bags. The contents, already half out and lying on the desert’s bed, were moving of their own accord. They were rising, reassembling. Flat Top Phil felt fear like he had never felt before. He tried to speak but only gibberish emerged. Then he lost his voice altogether. He couldn’t scream. He couldn’t run. Clutching his revolver tightly he blasted at bodies that were approaching. Unfortunately he was all out of silver bullets. Flat Top Phil had been using Nowhere to dump the families he disagreed with for years. Finally they had the chance to welcome him to their new home.